How To Save on Direct Mail Marketing After the Jan 27th Postal Rate Increase. The U.S. Postal Service (USPS) will implement new postage rates for most mailing postage on January 27, 2019 and unsurprisingly, they’re going up. 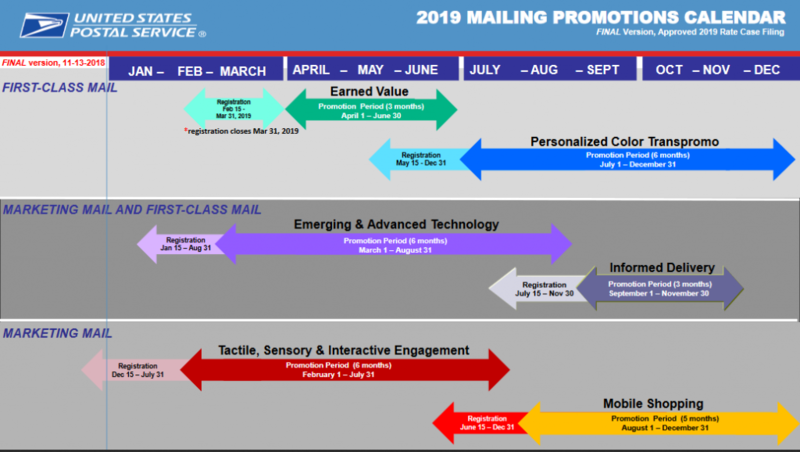 Now the good news…the USPS is offering 2019 promotions to encourage marketers to utilize new technology and print techniques that enhance the traditional benefits of a physical mail piece. The Mailing Promotions are designed to increase response rates and increase the mailer’s ROI. For Marketers, “The Emerging & Technology”, “Informed Delivery”, “Tactile, Sensory & Interactive” and “Engagement and Mobile Shopping” programs are applicable for Marketing Mail with a little help. For more information go to the PostalPro website, or contact an East Coast Media Mailing Specialist. Which 2019 USPS promotion is the easiest & most helpful for direct mail marketers? The “Tactile, Sensory & Interactive Promotion” is easy for any Direct Mailer to take advantage of, in-fact many of East Coast Media’s clients are already using these techniques on their printed materials. The “2019 Mobile Shopping Promotion” is a good middle ground for marketers looking to connect direct mail with relatively recent mobile technologies. The promotion incentives mailers to to use Quick Response (QR ) Codes, Snap Tags, and Watermarks to connect with shoppers during the 2019 holiday season. How can I take advantage of the 2019 USPS promotions? For over 20 years, East Coast Media has helped marketers identify the best technologies for cost-effectively communicating their message. These programs are laid out in detail on the USPS Website’s Promotions Page. If you want to be brought up to speed quickly on how you can increase your response rates with USPS promotions contact the mailing experts at East Coast Media.